H ave we gone fruity? Fruit is a healthy food, full of nutrients, high in fiber, vitamins, minerals, and low in fat and calories. It is a simply a great myth that fruit will make you fat! So don’t simply go cutting fruit out of your diet until you know the facts! I have been involved in and visited therapies overseas where many nutritionists and natural health clinics use fruit and vegetables (or fruit alone) as treatment for various health conditions, sometimes with spectacular results. While I personally do not utilise these methods exclusively, I have repeatedly witnessed fantastic results through the use of fruit and fruit juices. Properly used, fruit can have tremendous benefits without gaining a gram of fat! Actually I have never seen a person gain any amount of weight. In actual fact, weight loss has been evident on many occassions, as a positive result, even through this was not the main outcome that the treatment was designed for. With the advent of so many nutritional approaches to achieve the ideal look, numerous inquiries regarding the practice of omitting fruit, fruit juices or any of its derivatives from a diet have surfaced. 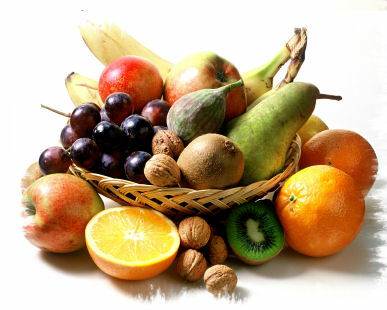 Fruit is a healthy food, full of nutrients, high in fiber, vitamins, minerals, and low in fat and calories. It is a common practice for bodybuilders during pre-contest preparation to omit fruit from their diets, as it should be for anyone looking to minimize body fat for this purpose. Now, having said the above, let me clarify a bit more. Is fruit the diabolical diet-killer it’s sometimes made out to be or is fruit actually pretty good for you? The simple answer to this question “can fruit make you fat” isn’t as simple as black and white…the true answer is yes AND no. (Here we go)! Are you confused? really it’s not that confusing! There are many studies on this subject, including fruit sugar (fructose) and how your body uses it. and how it’s metabolized in the body and liver, I’m going to talk about fruit from a practical standpoint. Fruit is fat-free (with the exception of avocados) and is low-calorie, and high-fiber food. It might be hard to eat ENOUGH fruit to result in an excess of calories, resulting in fat gain…hard, although not impossible. You would have to look REALLY hard to find someone who ate too much fruit and gained fat. However, we do need to mention that eating fruit roll-ups, fruit juice (with 10% real juice for example) and other sugary fruit subtances (not real fruit), may lead to noticeable weight gain. So there you go, is this really natural fruit? Of course not. However, there is little hesitation to hastily blaim fruit itself for our bad habits of eating unnatural, processed foods. I don’t know about you, but in reality I have never heard of anyone sitting down in front of the T.V and eating an entire bag of apples or their doctor telling them they need to stop eating so many bananas! Actually “real” fruit has a lot of water content, nutrients, fiber, etc…which is healthy stuff…stuff your body NEEDS and you need to be eating. I even remember years ago when I was telling diabetics that they MUST have some fruit – as they need the nutrients – and here we go today where this diet has changed so much and fruit is now allowed in diabetes diets. It’s when we start mucking around with fruit and create the fruit derivatives and “false foods” pretending to be “fruit” that we run into problems. That being said, there ARE metabolic issues with fruit and fat. The body has certain limits while it processes fructose (witch is found in fruit). Fructose can only be stored as glycogen (glycogen which is the carbohydrate storage in the body) in the liver, not in the muscles. Muscle cells lack the proper enzymes to convert fructose and store it well. So that leaves the liver for the storage responsibility…When your liver glycogen level is full and your body can no longer store any more carbs in the liver, fructose IS easier for the body to convert into fat than other carbs because of its molecular structure. When this happens the fat does NOT convert into body fat quickly, however. It becomes free fatty acids circulating in the bloodstream. If they’re not burned, (I repeat again, IF they are not burned) they will be stored as bodyfat. The OTHER good stuff you find in fruit, ( fiber) and vitamins and minerals, are outweighed by the “danger” of storing extra fat. Here is the main point that a lot of us miss, when we hear that fruit has the potential to work against fat loss when on a diet… If you’re dieting, you should be in a caloric deficit. This means that your liver glycogen levels should not be full. You’re in a deficit after all! 1. The fructose in your system should have little or no chance to convert into fat. 2. If it happens that some excess fructose in your system does convert to fat, your chance that it will be USED by the body soon after it converts to fat are good because you’re in a caloric deficit. Just like any other carbohydrate, if you eat too much of it, it will be stored as fat. If you are a competitive bodybuilder peaking for a competition, you MAY have to watch your fruit intake to be sure you look the leanest. However, for the average person wanting to drop bodyfat, fruit is not something you should be too worried about. You should be FAR more concerned about drinking too many soft drinks while dieting before I’d even be slightly concerned about them eating an apple. The bottom line, is this…don’t feel guilty about eating much fruit, even while dieting. Just treat it as you would any other food with calories in it and simply watch your intake. To minimize the impact of fruit on your fat-loss diet, eat it in the morning when liver glycogen levels are naturally at their lowest point. This will help ensure fructose won’t be converted into fat. Honestly, there are MUCH more important things to worry about when it comes to fat loss…your training and overall nutrition are much more important than worrying about eating too much fruit. Now for some bad news! Here is some information I have read in various journals – I will make it short so as this article is not long and boring. A natural sugar found in fruit is fuelling the obesity epidemic, scientists say. A study has shown that fructose – which is used to sweeten soft drinks and junk food – might be more harmful than other types of sugar. Pure fructose is found in fresh fruit, fruit juice and jam. – However, it also sneaks into our diet through the high-fructose corn syrup used in food manufacturing. Concerns about high-fructose corn syrup have been growing. – Some experts believe they play a major role in the obesity crisis sweeping Britain and the U.S.
NOW – Don’t give me the “scientific” research that says fructose makes you fat, and then go cutting fruit out of your diet and deprive your body of water in its purest form and many nutrients that your body needs. These studies are not based on fruit. They are based on fructose – which is extracted, concentrated amd added to corn syrup and other processed foods. “Volunteers on the fruit sugar diet put on more intra-abdominal fat, which wraps around their internal organs and causes pot bellies”. Of course we also get “studies” from manufacturers such as soft drinks that tell us which concentrated sweetener is better, fructose, glucose etc etc in order to make their product look good. Studies undertaken by the interested party are obviously biased and worthless. Here is an interesting study! – Read the headline – but then read on! Having read the preceeding article, you will better understand this and hopefully be as amused as I was. Scientists have come to the conclusion that the sugar that is found in fruit is making people more obese. If we just read this in a newspaper, it might be enough to put us off fruit forever. But read on, and you will see who the real culprit is. I have underlined some interesting parts. The study found that fructose which is used in drinks that you buy from supermarkets and or shops, and also is put into junk food (processed food) in the study participants were given large quantities of fructose, contained within drinks and/or food and, were found to put weight on around there abdomen area. Compared to other participants who were given glucose to drink and/or eat, healthcare specialists say that this particular type of abdominal fat is linked to diseases such as diabetes and also the possibility of contracting heart disease later on in life. Fructose can be found in things like jam and other fruits (hang on a minute here, what do we mean jam and other fruits – is jam compared to fruits? Is jam a fruit? I like how the word “fruits” has appeared in this sentence) however it can be included into other foods that we eat such as corn syrup there has been a lot of concern for quite a great deal of time now, about fructose corn syrup, and how it can affect our bodies. Scientists seem to believe that this is one thing that is fuelling the crisis within the UK as far as you obesity is concerned. Dear friends, remember that fresh fruit by comparison contains relatively low levels of fructose, all this does show and prove is that the food that is manufactured or processed tends to contain high levels of things that can in fact make us more overweight at the end of the day. I think that we don’t tend to pay much attention to what it is that we are actually buying. Is it not better to just stick to fresh fruit, and vegetables and forget about all the prepackaged foods that we can buy which as we can see are doing us no good whatsoever. There is good reason why added sugar, added fructose, corn syrup and the like are receiving bad publicity and are linked to health problems, ofthen quite serious. But don’t confuse artificial sweeteners, concentrates and processed foods, together with the advertising hype to the real and natural foods that give us much needed nutrition and keep us alive. Chemically-altered sugars like high fructose corn syrup and crystalline fructose are dangerous foods. Fruit and vegetable have great nutritious properties and some have been linked to containing anti cancer nutrients! So have some fruit and be healthy!